A local student spent two days at Options Theatre Company and learned more than he expected. Buses full of Options Theatre Company participants arrive, and the foyer fills with many inquisitive and happy faces. The walls are lined with posters from past shows. They are startlingly different to posters for the Sydney Theatre Company or the next Marvel movie. 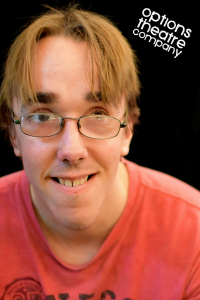 Here I see real people – actors with Down syndrome and Autism. People you see at the bus stop or the shops or the beach. These actors were once the students overlooked in drama class. They were given the silly costumes and songs to sing; so Artistic Director Stuart Smith later tells me. I spot a man with long hair who is featured front and centre in many of the posters. Nathan approaches and introduces himself, not delaying to give me a tour of Options Theatre Company’s rehearsal space. We find ourselves in the main room – a dark space lined with a large mirror, high ceilings, and lit with warm lights hanging from above. Nathan tells me of his several years at Options. 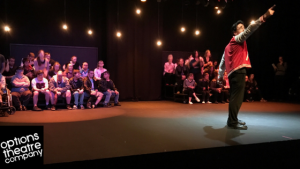 Seven shows and two films – “I love acting.” Nathan will be playing Danny Zuko in Options’ production of GREASE at the Art House Wyong showing May 26th-27th. The rehearsal starts for the day. The cast run through scene after scene, blocking lines and song choreography as they go. Alexander, who had been walking laps of the rehearsal space until his scene, now runs his scene with close attention from Stuart. He has learnt all his lines. Alex and his director high five each other – Alex has been working hard on his parts. His gratified smile lingers as he returns to walking laps. The rehearsal continues with a man singing “Blue Moon.” His name is Ty. Stuart explains how high above the stage Ty’s platform will be during the scene by grabbing Ty’s hand and motioning to the height of the platform. With their hands together he says “This high, Ty.” It’s not until Ty affirms that he has understood that I realise, Ty is a blind man. He nailed his number with a soaring swing melody. Stuart tells me of the history of the theatre company. Options has come a long way, from a time when support workers would deliver lines for the ‘participants’ – shows were heavily supported and scaffolded. The cast progresses through various key scenes, coming to Danny Zuko’s small monologue, Nathan works hard to get his six or seven lines for this scene down. “I don’t believe you, Nathan,” repeats Stuart bluntly, as he works hard to elicit genuine emotion from Nathan. Stuart reminds him how close the show is and of the full production rehearsal the next morning, and makes it clear that he needs to have the scene polished by the morning. Stuart seems to almost step over the line on this one, coming down hard on his lead male actor. It seems wrong because of the way many of us have been conditioned to think of people with disabilities. They can ‘follow their dreams’ all they like, but its taboo to call them to account for not working hard enough for it. The day winds down after the rehearsal finishes up. Some of the leads have a lot of work to do overnight. The buzz is tangible the following morning. The full cast of 60 and crew of five launch into the full production rehearsal starting with Act 1. As the next song starts, I realise how similar Options Theatre Company’s production of GREASE is to a normal show. For all the differences between actors like Nathan, Alexander and Ty – and other actors – much is the same too. Scenes and songs are repeated and improved. The ensemble chatter and sing and grumble and laugh. Couples have to kiss for their role and enjoy kissing for their role. One scene catches my attention. Louise, a woman in a wheelchair is pushed on to centre stage to say her line as the Headmaster of Rydell High. Some takes she gets it right, in others she misses her cue. “I don’t want to hear you complaining Louise; you’ve got one line.” At first I react in the same way to Stuart’s reproof of Louise that I did when Nathan could not remember his lines the day before. Then I remember our conversation. Stuart isn’t criticising Louise for her inability to play her part – he is pushing her to take responsibility, because he knows she can do it. Her grin after getting it right gives a glimpse of how liberating this is for a woman with limited movement and communication challenges; whose responsibilities growing up would have been taken from her before she could meet and over deliver on them. As the cast break for lunch and celebrate finishing their run-through of the show, I’m reminded of what Stuart said about why the theatre company exists. It’s about more than entertainment or teaching responsibility – many people with disabilities don’t have a lot of cross over into what we would call a ‘heteronormative world,’ and so the show, as Stuart puts it, is a “creative way of finding yourself in a social situation.” As I walk back through the rehearsal space, into the foyer and outside to the carpark, passing groups of performers eating, chatting and laughing, I note the first jarring feeling I felt when I saw the posters. I feel shame for tip toe-ing around people who have the passion and drive to be great entertainers, and for expecting less from them from the moment I arrived. Even before the first scene of the performance ends, I know they will all start listening.